Meditation is a life skill that enhances our well being and awakens our highest potential. Ocean of Compassion Buddhist Center will be offering Introduction to Meditation with our popular meditation teacher, Ven Jampa Sangmo. This course is appropriate for beginners as well as those who want to deepen their knowledge about Buddhist Meditation; everyone is welcomed. How meditation helps in daily life. There will be practice sessions covering all subjects. Buddhist meditations can be used by anyone to increase their peace and happiness. Introduction to Meditation is presented in four sessions. You may come to one or all the sessions. A Foundation of Preservation of the Mahayana Tradition FPMT Certificate is given to those who complete the entire course. Venerable Jampa Sangmo is a Tibetan Buddhist Nun. In 1966 she was first introduced to meditation at University of California at Los Angeles when Maharishi Mahesh Yogi was invited to give a lecture. Her interest in meditation led her to the exploration of Zen, where she studied with Thich Nhat Hanh, and Vipassana, where she did numerous long retreats. She came to Tibetan Buddhism in 1993 and began her studies with several Buddhist Masters including Lama Zopa Rinpoche, Choden Rinpoche, Ribur Rinpoche, and His Holiness the Dalai Lama. In 2008 she took robes with her teacher Khensur Jampa Tegchok Rinpoche. 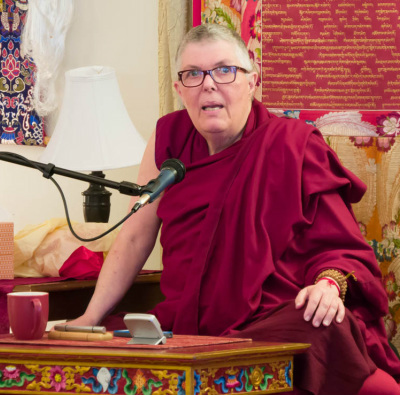 She has lead meditation groups and retreats for Chevron International, Land of Medicine Buddha, and has co-lead retreats at Vajrapani Institute. For the past 4 years she has facilitated an ongoing group with “Woman Care Santa Cruz” to support women who have cancer. She is passionate about teaching meditation and how to incorporate it in everyday life. Suggested donation: $15 per class or $40 for (4) classes if paid in full at the first class.